At times, you might need to mount an ISO file to view the contents of the ISO file, or may be, you might want to mount a Windows OS ISO file to quickly copy ISO contents to create a bootable USB flash drive. Though Windows 7 doesn’t support ISO mounting out of the box, there are some good free utilities to mount an ISO file. In general, one needs to burn the ISO file to CD/DVD to view and use the contents of the ISO file. But if you don’t want to burn the ISO to a CD/DVD, you can use third-party tools such as Virtual CloneDrive to easily mount ISO files. Virtual CloneDrive is a completely free and easy-to-use ISO image mounting software for Windows XP, Vista, and Windows 7. It can easily mount .CCD, .BIN, .UDF, .ISO, .IMG, and .DVD files. # Download and install the software from here. # Right-click on the ISO image file that you want to mount and select Mount (Virtual CloneDrive (drive letter)). # Now, you can see the new virtual drive in the explorer (My Computer). Step 1: Navigate to the drive or folder that contains Windows 7 ISO file. 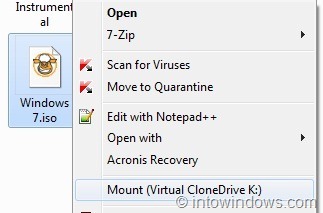 Step 2: Right-click on the ISO file, and select Mount (Virtual CloneDrive (drive letter)) option. Also notice the drive letter provided in the option. Step 3: Now open Windows Explorer and open the virtual drive to see the ISO file contents. You can now copy all the contents of the drive to your desired drive or folder. Article is outdated because the download domain is expired. Update it with ULTRA ISO Link. upgrade on my previous comments: It is not ISO for windows 7 and 8, It is ISO for both 32bit and 64 bit. Can i download windows 10 and upgrade my Windows 8.1 instead if waiting for the cue? I have already downloaded a boot-able ISO files for both win 7 and 8. I have tried installed it in one of my laptop and it worked perfectly well. But the problem is I have to activate it t full version. Please let me know if there is a way to install the upgrade rather then waiting for it to come. and i got this – > How To Mount An ISO Image In Windows 7.